Why do different risk models give different scores? I sometimes get a low risk score when I know the patient needs BRCA testing? The risk models are all different and are all more or less sensitive to different aspects of risk: Gail only incorporates 1st degree relatives, while Claus, which incorporates 1st and 2nd degree relatives, ignores hormonal issues and pathology factors. 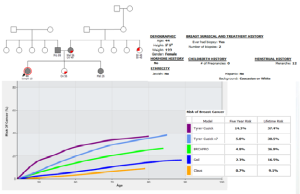 Some of the models are changing such as Tyrer Cuzick version 6 to 7, and Tyrer Cuzick7 gives higher lifetime risk, and BRCAPro is constantly being updated. Model issues: We are reporting the model result. That does not mean they are consistent or usable in real life. Different models have different inputs and this will have different outputs. Different models are useful in different circumstances. When you see discrepancies, do not be surprised. Gail uses almost no family history, so will have much lower numbers than BRCAPRO in a hereditary family. Tyrer Cuzick6 vs 7 use a different baseline risk group and use a different max age, so they will also differ. George E. P. Box (statistician) said: “All models are wrong, but some are useful.” These models are useful, but each in their own particular way for a particular circumstance. In this figure I have chosen a family history that accentuates the differences between the models. It is not that the models are wrong, but that each one has its strengths and weaknesses. We are looking at ways to impute a family, negating the need for entering the age of every relative. By doing so, we get almost all the value of the most sophisticated models with a fraction of the data input, and this is important given the need for efficiency in the day to day practice of medicine. Biswas S, Atienza P, Chipman J, et al, Simplifying clinical use of the genetic risk prediction model BRCAPRO, Breast Cancer Research and Treatment, June 2013, Volume 139, Issue 2, pp 571-579. Please review blog by Dr. Kevin Hughes titled “Many Breast Cancer Risk Models: Which One is Accurate?“ which can be accessed at http://www.hughesriskapps.com/20141010-1.php.